You are here: Home / Our Team / Shaun R. Vaniman, D.V.M. Dr. Vaniman was born and raised in Bozeman, Montana. He spent his youth enjoying the outdoors hiking, camping, skiing, snowboarding, fly fishing and exploring wilderness areas. He earned a BS in Biology from Montana State University, a year of which was spent as an exchange student in Christchurch, New Zealand at the University of Canterbury. In 2008, Dr. Vaniman earned a Doctorate in Veterinary Medicine from Washington State University. During vet school, he did rotations in places such as Thailand, Costa Rica, and Honduras. After graduation, he practiced medicine in a busy small animal clinic in Vancouver, WA. In 2010, Dr. Vaniman had the special opportunity to pursue his love of travel. He took a break from clinical practice to travel extensively throughout Central and South America. His travels gave him a chance to provide medical care in developing countries, learn the Spanish language, explore the natural world, and explore himself within. Although his love of the Argentine tango tempted him to stay in Buenos Aires, he was drawn back to the Northwest. He became the owner of Hillsdale Veterinary Hospital in January of 2013 and seeks to continue the legacy of excellent care. Dr. Vaniman takes pride in providing care for his clients that centers around meeting the needs of both the pet and the person. Family and friends are of utmost importance to Dr. Vaniman and pets fill the role of both in our lives. He was “raised by three labs” – Libby, Carlie, and Izzy – who taught him the unconditional love and companionship of pets. 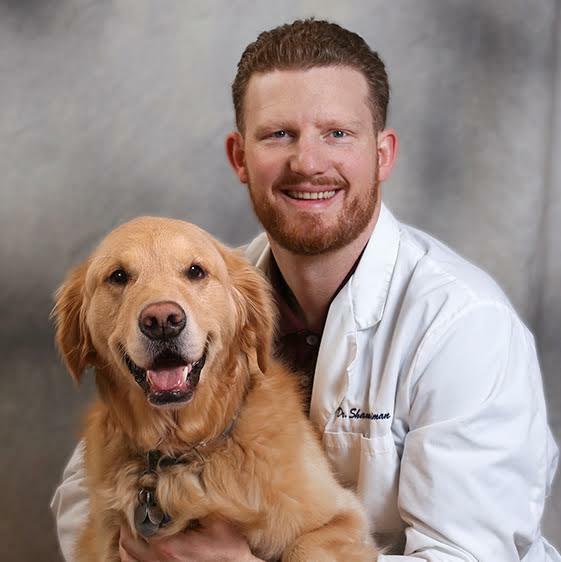 He believes in a balanced approach to pet care that includes integrating current medicine and technology with practical and proven methods, blending medicine and compassion to provide the highest level of care available. Dr. Vaniman’s professional experiences have given him the opportunity to work with breeds highly sensitive to anesthesia such as Greyhounds, Bulldogs, and many large breeds. He especially enjoys surgery and radiology. When Dr. Vaniman is not practicing medicine you can find him tearing up the slopes, playing ultimate Frisbee and disc golf, exploring the beauty of the Northwest, or more often than not, dancing tango in a local Portland milonga. Dr. Shaun es uno de los pocos veterinarios que habla Español en Portland. Dr. Shaun is one of the few veterinarians that speaks Spanish in Portland.